This is tough! I love new experiences and trying new things, but I guess my go-to comfort food is ice cream. I always have some in the freezer and have a bowl almost every day, usually with chocolate syrup, of course! People always expect bartenders to have tattoos! I have four; three small ones, one of which represents my son. The fourth is the newest, and it covers half my back. They all have pretty significant meanings to me. I’m planning on more, but not until I find ones that have deep meanings. To me, tattoos are symbols of what is important to the person, important enough to wear forever. I’ve been ticking off things on my list for years, I don’t want to wait until I’m old and try to cram things in. Next year I’m visiting Machu Piichu, that’s a big one, but probably my ultimate is to fly through the mountains in a “squirrel suit”, over the tree tops – that looks amazing! I’ve never really wanted one, they always seem to come at a price. I suppose immortality is the only thing I’d want, so I can live long enough to visit the stars, to see what else is out there. There is so much to experience in life, more than can fill a single life time. Put the lime juice, bitters and a couple basil leaves in a mixing glass and gently muddle to express the essences of the basil flavor without tearing up the leaf too much. Add the gin and vermouth, and ice. Stir by gently, but rapidly, rotating the spoon around the sides of the glass, causing the ice to spin in the glass as one mass, for 60 rotations to dilute and cool the drink. 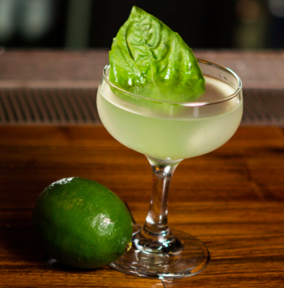 Strain into a chilled cocktail/martini glass and garnish with a single basil leaf slapped between your palms to express the aromatics. I came to bartending late, after I turned 40, which I think gives me a different perspective from most, who start decades earlier. It’s a very different world from the Monday-thru-Friday, 9-to-5 world I lived before, and one you have to love because it effectively separates you from much of the world. It also gives you perks few other careers can! I’ve been a professional woodworker, a single father, a business owner, I even tried my hand at acting for awhile. I love food and stories and people. 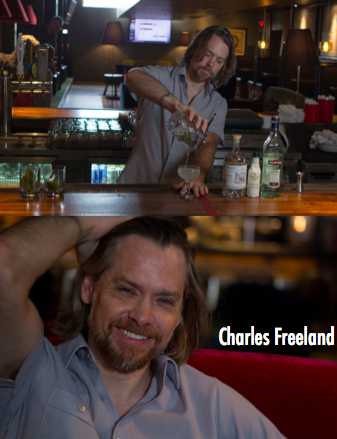 When I discovered the world of spirits and craft cocktail culture, I found a whole new way to explore and create, and have fun while working. In the few years I’ve been behind a bar, I’ve been able to do things, go places, taste and experience things I never would have otherwise. I’m eternally grateful for all the people who have given me opportunities along the way. As much as I love my job, I believe it is important to have a life outside of work. I’m careful to not get so wrapped up in my career I forget to live; that’s probably a response to being forced into hard life choices when I was younger, but I think its makes me a better person, which I hope I bring back behind the bar with me. I’m not ambitious about advancement, or starting my own bar someday. I just enjoy what I do – playing, experimenting, learning, and sharing all of it with others. It’s a good life, and I hope every guest who sits at my bar gets to experience a little of that for at least a few minutes in my company – and in my drinks.